MicroNIR PAT-W | VIAVI Solutions Inc. The MicroNIR™ PAT-W is a battery-powered rugged NIR spectrometer equipped with WiFi connectivity for data communication making it suitable for use on rotating blenders as well as other stationary process equipment. The MicroNIR PAT-W spectrometer is a fit-for-purpose near-infrared (NIR) analyzer that is meant for quality-by-design (QbD) manufacturing. The spectrometer is a sturdy, scalable, next-generation system for real-time process monitoring in blend homogeneity, content uniformity, loss on drying, compaction, and other process analytical technology (PAT) applications. With the well-established Viavi linear variable filter (LVF) technology, the PAT-W has the smallest form factor among commercial process monitoring instruments in a fit-for-purpose design. This makes it ideal for use with processing equipment of a variety of sizes, with the stability and performance to facilitate efficient and smart manufacturing. The user-friendly MicroNIR PAT-W was engineered to handle today's challenging GMP-regulated environments yet requires minimal system maintenance. There are no expensive fiber optic cables or no moving components, thus enabling superior instrument stability and performance in challenging process environments. Its stainless steel/brushed aluminum cabinet is water and dust resistant according to IP67 standards and cleans easily. The software package allows for positioning flexibility from process/product development to manufacturing environments and offers audit trails, comprehensive user management, encrypted secure data storage, and several other capabilities required for regulated GMP environments. The MicroNIR PAT control software enables instrument performance qualification per USP 1119 criteria, easy data acquisition, technique investigation, user management, technique development, and the visualization of moving block standard deviation (MBSD) trends. The MicroNIR PAT-W has been designed with maximum flexibility in mind to meet the many different criteria for process integration. It incorporates into a process three different mounts. 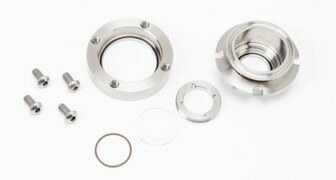 This includes a weld in base flange, a 2” sanitary (hygienic) flange mount, a sapphire window, and a retaining ring with O-rings. The base flange is welded into a hole cut in the lid of a blender and then the sanitary flange mount, window, and retaining ring are assembled. Next, the PAT-W with an adaptable collet is secured against the window and a sanitary flange using a standard tri-clover clamp (or C-clamp). All pieces can be dismantled for easy cleaning and maintenance. 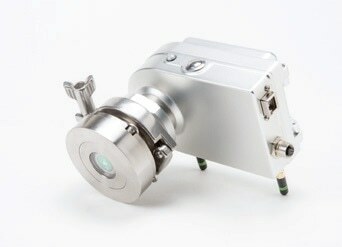 The threaded mount allows a user to weld a mount into the process equipment and then link the PAT-U using the threaded tip of the spectrometer. 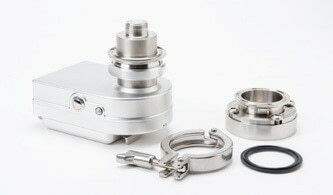 This mount also has a removable window to allow easy cleaning and maintenance. When used on a rotating blender, the PAT-W has an integrated nine-axis inertial measurement unit (IMU) that consists of a three-axis gyroscope, a three-axis magnetometer, and a three-axis accelerometer. 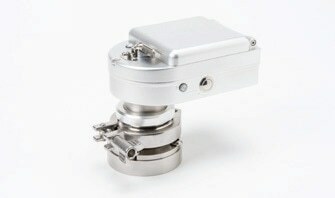 The IMU enables highly accurate and repeatable triggering of the PAT-W. 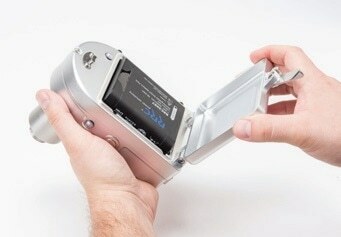 The MicroNIR™ PAT-U is a USB-powered rugged NIR spectrometer. It is the smallest of its kind on the market making it suitable for use on equipment of different sizes as well as implementation of multiple of the analyzers on a given process.